What differentiates the good from the great is the attention to the basic elements; the specifics; the nitty-gritties that give a bigger product the finer definition. Be it the carvings that decorate the stone walls of our great temples or the intricate calligraphy that adorn the mosques, it is true that “God is in the details”. Not just right for architecture or design, this theory holds good across fields. Even when it comes to e-commerce, the main factor that makes or breaks a company is its efficiency in getting the finer aspects right. In a world that is exceedingly networked, anybody can start up their online marketplace. Setting up the logistics behind it is what proves to be a bigger hiccup. Worldwide business-to-consumer (B2C) e-commerce sales are expected to plummet by 20.1% this year to reach $1.500 trillion. (Source: eMarketer.com)E-commerce in Asia specifically is increasing steadily, thanks to China and India expanding e-commerce facilities by the day. Internet penetration with service providers giving plans at lower costs, Smartphone usage, demographics, regulations and rules, industrial real estate facilities and most importantly, logistics, are some of the key factors that directly impact the growth of e-commerce. While a burgeoning growth in internet and technology gives everyone an equal playing field, it is solely the logistics of delivery that prove to be the deciding factor in the growth, success, competence and dynamism of any e-commerce venture. Research indicates that when a company’s supply chain management functions well, consumers are sure to prefer that business over any other. The last 40 years have seen a paradigm shift in the way delivery systems work across the globe. From the time in the 70s when retail stores were directly sourcing their goods from suppliers or wholesalers, to centralized store deliveries in the 80s, global sourcing and import centres in the 90s to e-commerce and e-fulfilment distribution networks in the new millennium, retail logistics have evolved and how! E-tailers toggle between options of employing courier companies, specialist third-party logistics provider to handling the logistics in-house. At the end of the day, whichever means they use to get to their end, all that matters to the company are a few key points that need to be executed – efficient and accurate delivery, cost-effective service and a cutting edge enterprise resource planning software or ERP that organizes product planning, cost and development, manufacturing, marketing and sales, inventory management, shipping and payment. If an e-tailer is into cross-border trade, this entire process needs to be implemented by the logistics agent with greater exactness, now that international laws and regulations come into play. The entire function of procurement, storage, invoicing and delivery are determined by four factors – speed (so the delivery is ‘on time, every time’), accuracy (so people get what they ordered for), scalability (so growth is met competitively) and surge (the traffic Vs fulfilment graph). The greater transparency with which this entire supply chain management is setup, the more an e-tailer wins the faith and favour of the customer. 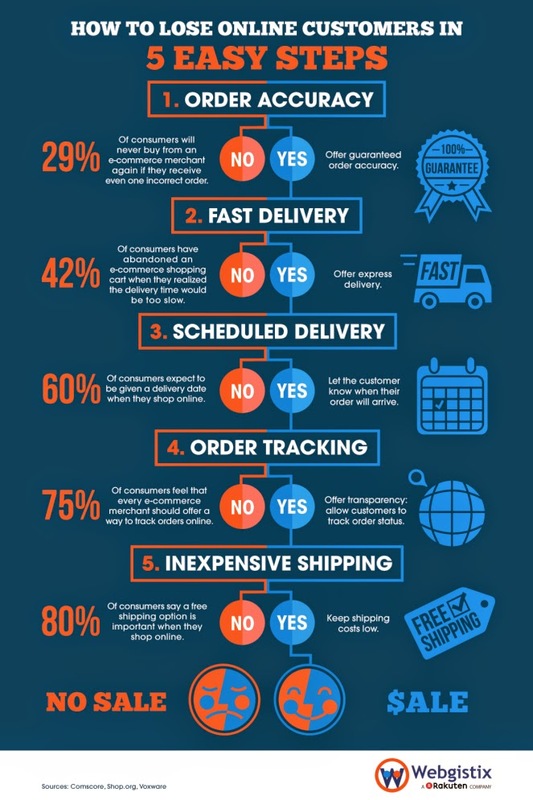 Research by Endicia suggests that shoppers value delivery time, facilities like free shipping etc over anything else, when it comes to shopping online. Due to loss, damage or incorrect delivery, e-commerce players also need to establish a reverse logistics unit that helps with product returns. A good returns process coupled with an efficient Customer service team will go a long way into rebuilding the trust of the customer who feels denied with a wrongful or damaged delivery. One other thing to do is to establish proper preventive measures to avoid loss or damage. Accurate labelling, using tracking facilities, employing quality materials for packing, insuring parcels, providing package cushioning and appropriate packing, travel and delivery services would go a long way in saving plenty of money, time and energy spent in returning a broken good. Successful e-commerce thrives by embracing new logistics models and utilizing distribution properties. With plenty of innovation and refinement, there are better facilities available today in terms of logistics. Mega e-fulfilment centres stocked up with merchandise that operate 24 X 7 have even made same-day delivery, a possibility. Items are now picked from exclusive parcel hubs, categorized at sortation centres and sent to parcel delivery centres to ensure that the right packages reach at the right time. With competition increasing by the hour, more and more local depots for rapid order fulfilment will become a possibility. A research by JLL indicates that the evolution in the offing is for multi-channel retailers to move to omni-channel, which ensures that “all the channels (store, web or mobile) are managed in an integrated way to give the customers a seamless experience, however they choose to shop and from whatever location. All the talk of advancement apart, as per a recent research by Webgistix, the trick of the trade seems to be the usual – get the basics right in order to have a competitive edge and not lose out on the customer base! And once that sets in and a company is looking towards expansion, there is the next round of factors to tackle. E-commerce related warehousing has been concentrated mostly in Tier 1 cities in most countries and unexplored markets could be a great place to stretch business into. With better management, an encouraging tax structure and more facilities to establish distribution networks, these facilities can spread uniformly and take development even to the villages. Many developing nations still have miles to go before ecommerce becomes a common way of life. “Feet-on-the-ground knowledge, particularly of supply chain, properties, real estate transactions and cross-border commerce opportunities, is vital”, says the JLL research when describing what will set one e-tailer from the other. Carbon neutral shipping, sustainable packaging, etc are other interventions that impact the environment the least, ensuring socially responsible commerce. With cross border trade assuming a larger role, significant changes need to be made to ensure a good distribution network, especially in emerging markets. The global retail landscape has never been more receptive to innovation and growth. 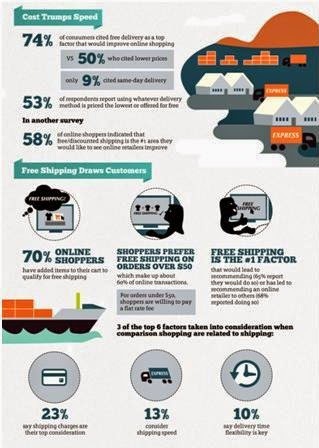 The escalating numbers of e-tailers will be a reason to delight over only if backed by successful logistics fulfillment. This is a $231 billion industry. The race is long and hard and the only way to stand out is to reach high. And a good logistics team will do just that – deliver you safe and sound, right to the very top!